A beautiful young woman, always effortlessly fashionable, Meyers is almost an anomaly in today's culture. In a world where young artists seem to continually wind up as troubled tabloid fodder, she's a successful recording artist who is incredibly grounded and ever mindful of her platform as an influencer. She's equally comfortable appearing on the cover of Nylon Magazine (Japan) or speaking to young girls on the Revolve tour, an outing she's looking forward to this fall. Meyers first burst on the scene with her self-titled Essential Records debut in 2005, spawning her breakthrough hit "Anticonformity," a song she wrote at camp before entering ninth grade. Her debut set spawned four top ten singles and also launched her career abroad. Her sophomore album, Dying For a Heart, solidified Meyers' stature as one of the top artists in Christian music, earning her a second Dove nomination in the female vocalist of the year category--and boosting her audience overseas, earning her major pop star status in Japan. Meyers has performed before more than 400,000 people, and will be part of the Fall 2008, 16-city Revolve Arena Tour. 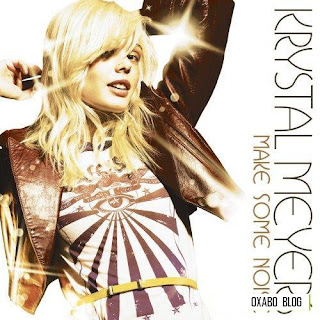 You are viewing "Krystal Meyers - Make Some Noise (2008)"